Baby leather moccasins are made from cow suede leather by the Huron in Quebec, Canada. All moccasins come in a nicely decorated shoebox. Cows are not an endangered species and are not subject to CITES. 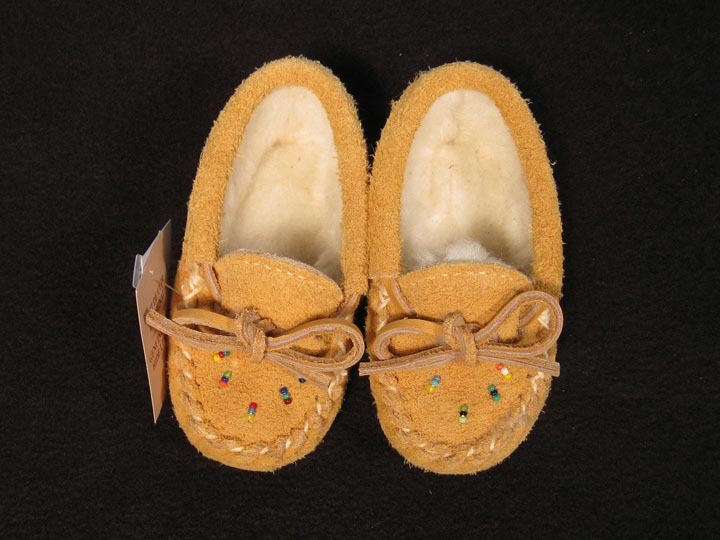 These baby moccasins are made from moose suede leather by the Huron in Quebec, Canada. They are lined with fleece and decorated with seedbeads. All moccasins come in a nicely decorated shoebox. These baby moccasins are made from moose suede leather by the Huron in Quebec, Canada. They are decorated with seedbeads and come in a nicely decorated shoebox. These children's moccasins are made from moose suede leather by the Huron in Quebec, Canada. They are lined with fleece and decorated with seedbeads. All moccasins come in a nicely decorated shoebox.